I’ve written about our adventures at the Estivant Pines near Copper Harbor over the years. If you go to the search box of the blog and type “pines” you’ll come across several. Alice and I have been volunteer stewards at the pines for many years now. We make about a half dozen trips per year to the pines, and try to do one early in the season to clean up the windfalls on the trails, and late in the season to prepare the place for winter. Late April/early May is the time frame for our first trip of the year, so last night we decided today would be the day. I should tell you that all the snow is gone from our woods except for the most sheltered places. There is a bit of snow also on the sides of our road where this winter’s banks were very high. We set the alarm, got up and going after tossing the chainsaw, Pulaski, and some granola bars in the truck. Our habit is to stop at Slims in Mohawk for breakfast, and we had a very enjoyable one this morning. It is mostly a local hangout, and we enjoy each other’s company as well as observing the local color. Heading north again, we made it north of Phoenix to the covered-road section of US41. This is a hilly, twisty, and lovely stretch of highway that has large trees close on both sides. Much to the chagrin of some of the commuting locals, I drive pretty slowly through this stretch. There seemed to be quite a bit more snow in the woods here than we’d seen so far on the trip. When we came to the T intersection at Copper Harbor, the place was mostly deserted. There were a couple of guys with reflective vests standing next to a public works pickup, and they looked at us driving by with some interest. My guess is they knew most of the vehicles that went by this time of year, and ours wasn’t one of them. We turned off US41 at the visitor’s center, and headed towards the trailhead. When we came to the turn-off to the Clark Mine Rd, the road was blocked with a Road Closed sign. Uh-oh. There was a well worn path around the sign, so we followed it. The dirt road leading to the old mine was a little chewed up here and there, but in pretty good shape otherwise. After a bad stretch on an uphill, I stopped, locked in the hubs, and shifted to 4wd. We made the turn to the Burma Rd., and proceeded down the road for about 1/4 mile until the snow took over. We decided to back up and park the truck on a little side pocket. We shouldered the gear, toilet paper, and walked the rest of the way. 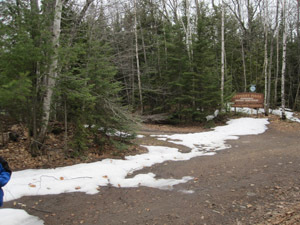 As we walked up to the entrance to the pines’ parking lot, we could see there had been few or no visitors yet this year, since the snow was relatively undisturbed across the entrance. We did our chores in the bathroom, shouldered the gear, and started hiking up the trail. It got interesting pretty quickly. The small cool creek that normally meanders under a small bridge along the trail was chuckling right across the trail. A little further on, there was a deep snowdrift that required some careful steps to get safely across. Around another corner, and we were confronted with a field of snow drifts extending as far as we could see up the trail. 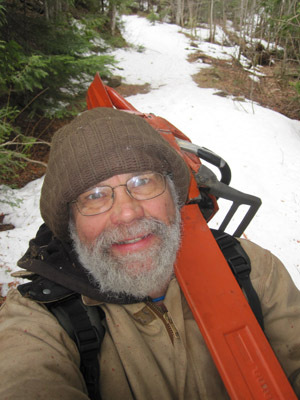 I took this selfie with my chainsaw across my shoulder at the point where we gave up our quest to improve the trail. We’ll be back later on in the year when the snow is gone and the spring birds are singing. After I took the picture, I did force myself to stand quietly for a few moments. The magic of this place, which hasn’t been very much disturbed by humans for a long while started to seep in. Seeing big marketable trees lying on the ground with moss and lichens growing on them in patterns only mother nature can conceive was the highlight of the day for me. We reluctantly turned around and headed back to the truck, looking forward to our next opportunity to visit the pines. So many of our projects are ongoing. You pick away at them for days without really thinking much about it, and then all at once what seemed like an insurmountable task is completed. All the days of picking become worthwhile when the task is completed. Today I finished washing, sanitizing, and rinsing all the maple syrup equipment. I saved the stainless steel barrel for last because it is the most fun (this is satire.) I have to stick my head down in the thing in order to scrub it out. This isn’t so bad during the wash and rinse phases, but the sanitize part is kind of an ordeal. I put one pint of concentrated clorox into 4 gallons of cold water, and that gets dumped into the barrel. 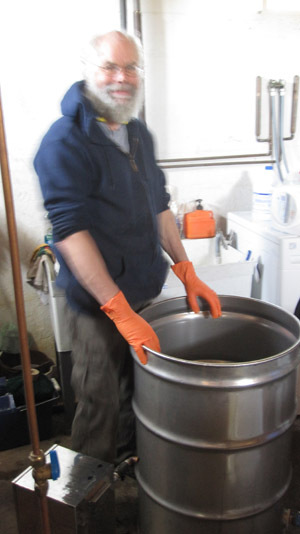 Then I have to duck inside and scrub the inside of the barrel to make sure it is completely sanitized. 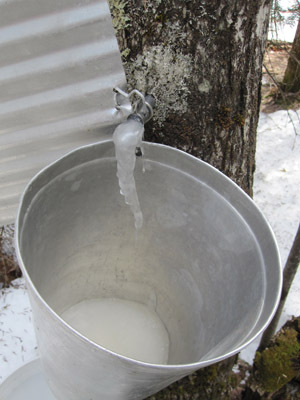 This has to then be triple-rinsed, because even a tiny residual of chlorine odor can taint next year’s syrup. Now all the buckets, lids, evaporator, and other miscellaneous gear are stacked up. I still need to haul it all out to the shack and put it away for next season. Alice and I also worked in the garden for about an hour today. We removed all the tomato cages and the chicken wire frames we’d put up for the climbing plants. Once all was clear in the greenhouse, I got our old reliable TroyBuilt ™ out, checked the gas and oil, gave the rope one tug, and it started right up. I did an initial deep tilling on both gardens, and things look real good out there now. It was a little wet yet, but dry enough for our first pass of the season. Our tomato plants are still pretty small, but they have 3 or 4 weeks to grow before they can spread their roots in the real ground. We hope to get the greenhouse cover up soon. Spring is happening. Alice and I have participated in the Annual Midwest Crane Count for many years. This morning we did it again. What do we do? We set the alarm for a time earlier than any retired person should have to get up, rise and get dressed for winter rather than early spring weather. We drive up the hill with clipboard, binoculars, and clock, arriving at our site at 6:30 am. We stand there quietly listening and watching for Sandhill Cranes. When we hear them, we note the time, type of call, and the direction we heard it. If we see them in the air, we note the number and direction they are flying. If we luck out and actually see one on the ground, we spend a lot of time looking at them in our binoculars. We do this until 8:30, when we get into the truck and drive to the local restaurant where we have a hot celebratory breakfast. This project is part of a large group of Midwest volunteers who all come out at the same time and count the birds. It gives researchers a good snapshot of how the crane migration and nesting is going. That is what the International Crane Foundation gets out of it. Alice and I have the opportunity to stand quietly in one place from before dawn until well after sunrise looking and listening for birds. It is always a magical experience for us. How often in our lives do we take the time to just listen and watch for birds? And since it is such a great experience, why do we only do it once a year? In Ernest Thompson Seton’s book, “Rolf in the Woods,” one of the main characters, a Native American named Quonab, climbs out of his hut every morning before sunrise, carrying a small drum, and as the sun comes up, he faces the light and sings a small song thanking the sun for rising again. For the one day of the year we do the crane count, we get a sense of the magic and wonder that Quonab must have felt at the dawning of each day. The first quote, “It’s all about the money, boys,” came about when the Cyclops robbed our heroes of the money they’d been given by Baby Face Nelson. The second, “The difference between a little money and no money at all is enormous, and can shatter the world! And the difference between a little money and an enormous amount of money is very slight, and that can shatter the world too,” was spoken by Dolly near the end of the play. If there is a theme in these 500 posts, it is there are ways to achieve satisfaction in life beyond the typical one of attempting to accumulate more and more money. Because, money is only an agreement between us that I’ll provide something you want or may want, in exchange for something I want or may want from you. As soon as we lose faith in that agreement, the money thing collapses. A great example of this loss of agreement happened in Zimbabwe, Africa in mid-November, 2008, where the inflation rate peaked at 79.6 billion percent. Zimbabwe abandoned its currency in 2009, and still does not have it’s own, relying on the currency of other countries to conduct business. Now it can be argued that some pretty stupid and selfish people were in charge of Zimbabwe when their currency collapsed. But if you listen to the news as I do, I doubt you’ll hear our politicians, who are responsible for the financial solvency of our country, sounding smart and unselfish. The loss of agreement over the value of currency seems as likely to me here in the United States as it was in Zimbabwe. The question I asked myself many decades ago was, supposing social order collapsed as a result of inevitable political ineptitude, what would I want to have in my back pocket to assist in surviving? These were the hippie back-to-the-land days, and it seemed to me that having some acreage with the ability to produce some resources to keep going through the rough patches would be at the top of the list. And, collecting both good tools and the knowledge to use and care for them is also near the top of the list. The unintended but welcome bonus from all this has been the satisfaction one gains from putting brain and muscle into a project, and enjoying the fruits of the labor. The moral of the story? If the lifestyle I’ve been writing about appeals to you, start the process of finding a few acres where you can put down roots, figure out what you’d like to produce on your land, roll up your sleeves, and get to work. It has worked for me, and it might just work for you too. Like everything that is funny, this saying has something absurd and something true in it. The true part is a lot of farmers do keep going even when the handwriting is on the wall that their farm is a financial failure. What causes folks to work incredibly hard in an industry that is among the most physically dangerous, and which can lead to financial ruin? I have a theory. My professional life was spent at Michigan Tech University, where I was involved in computer support. 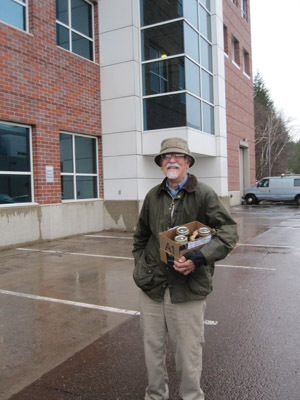 I was the campus email postmaster for a spell, took care of MTU’s gopher server, and was responsible for the university’s first web page. I think I was best at listening to folks that had a problem that could potentially be solved with a computer, and then bridging the gap with them to make that computer solution happen. I met a lot of fine people, and felt good about the work I did. But there was something missing. At the end of the day, I had nothing really tangible to show for my efforts. Many times when Alice and I talked about our work day, I couldn’t think of a single thing I’d done, even though I’d been busy all day. I’m knee deep in the maple syrup season right now. 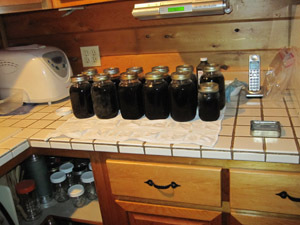 I spent 4 hours in the woods boiling and working on firewood, then spent most of the evening bottling the 3 gallons of syrup that had accumulated in the refrigerator. I can look at that line of quart jars on the kitchen counter, and have a very good idea of what I accomplished today. Out in the woods, I used my chainsaw to clean up some balsam fir tree trunks left over from the boughs I’d gathered for wreaths last Christmas season. These wood blocks will be firewood for next year’s boiling season. I don’t have to scratch my head to figure out what I accomplished today, because the results are all around me. And there is something seductive about having a plan, and making a demonstrable dent in implementing that plan. There is also something seductive about our Saturday morning ritual breakfast of pancakes and the world’s best maple syrup, produced on our own property with our own hands. You are currently browsing the Rural Life in the UP of Michigan blog archives for April, 2015.